Hunger-pangs can strike anytime! Even at midnight! Then, just like Cinderella ran away from the ball, we run to the fridge or kitchen! If I feel hungry, I dish out the favorite recipes of mine in a jiffy! Okay, I am exaggerating! Jiffy is a very short period of time! To prepare anything good, we need to invest time and effort! I am sharing this recipe that's easy to prepare and does not take much time either! 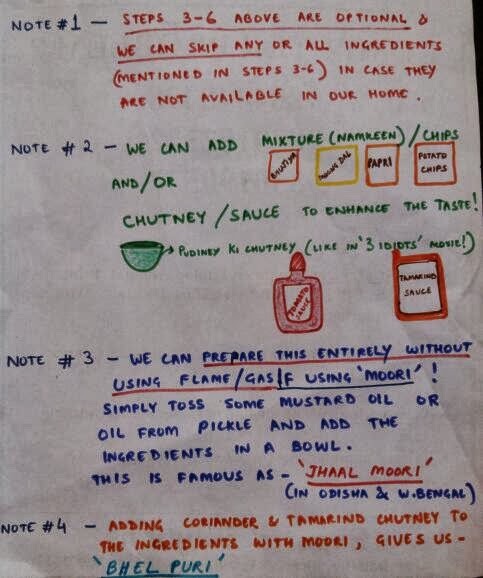 I have named the title of this Post as 'Two-In-One Snack Doodle' as I have created a Doodle that illustrates the recipe for 'Moori Bhaja' or 'Chuda Bhaja'! Preparation for both is the same! But, the main ingredient may be 'Moori' (Puffed Rice or Kurmura) or 'Chuda' (Flattened Rice or Poha or Chirwa)! It's a dish that I simply love! 'Moori Bhaja' or 'Chuda Bhaja' is really filling and healthy! It tastes best with Mustard-Oil. It is non-oily as it doesn't require much oil! Note- 'Chuda Bhaja' needs a teaspoon more Oil than 'Moori Bhaja'. In Odia language, 'Bhaja' means 'fry'. We can also prepare it as a dry snack using Moori and other ingredients and without using Gas/Flame at all! That ways, the recipe is 'Jhaal Moori' - that's a popular snack in Odisha and West Bengal. Adding Sev, Papri, Chutney and Sauce can give it the taste of 'Bhel Puri' - Mumbai specialty, now relished nationally! Note- Doodle Recipes are simple hand-written recipes with little doodled drawings. Each Doodle Recipe is a unique and fun expression of an individual chef. They can be easily made on normal paper and can be scanned or photographed to be submitted. This entry won a Consolation Prize in the Contest! You can see the list of Winners HERE. This is wonderful, Anita! Such a neat doodle....and a great recipe, too! It's one of my favorite recipes that always satisfies my hunger & spicy tastes! :) Glad you liked it! You are most welcome to try it out! Am sure you'll love it as much as I do! Thanks for stopping by, Rachna! Nice to know that you loved it! 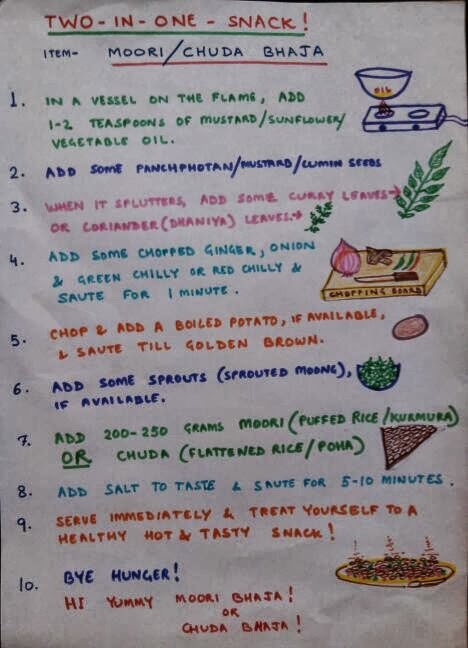 Great Recipe..I love this Moori or Chuda Bhaja..And they are sure shot hunger minimizer..
That's so nice, Harsha! We in Eastern India have similar tastes! But, this dish is so yummy it can appeal to all-India! There are different styles and ingredients for preparation, varying from place to place! Thanks a lot, Preethi for your sweet words and wishes! Thanks Aditya! Glad you liked it!